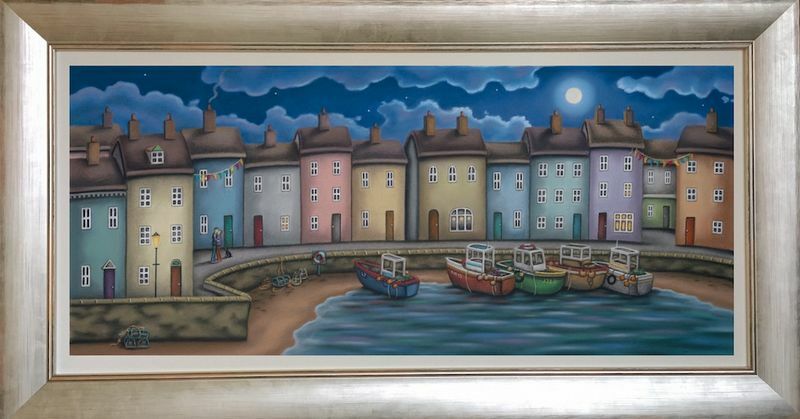 Paul returns to one of his most popular scenes to paint: a harbour (all be it a small one against the side of a small fishing town) and in Horton's trademark style of late, his mixes up and places some of the favourite elements you have seen over the years in his art. Apart from the little fishing boats anchored, his trademark multi coloured houses are there and of course the smoking chimneys we all like to see! Did you notice the couple embracing on the left-hand side? with his small black dog character there beside them, waiting patiently for his turn for attention. The bunting which appears in some popular limited editions is there – reminding you instantly of ‘village England’ - but the piece de resistance, is the Victorian style street lamp...with its warm amber light. Only question is, can you spot it? This on canvas edition is a must have for lovers of Horton's heart warming naive style.